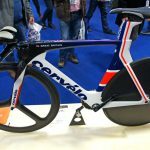 I was fortunate enough to stumble upon one of the Team GB track bike frames used in the Rio Olympics at a recent motorsport engineering show that I was attending for work. Having recently read Chris Boardman’s book and learnt about the “Secret Squirrel” program developing the equipment for the next Olympics and the Team GB medal factory. 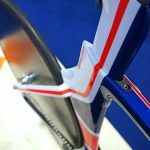 It was fascinating to see the latest creation, the product of wind tunnel testing and computer based aerodynamic modelling simulations. 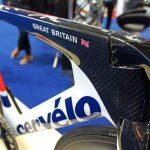 At this point in time it’s probably the most aerodynamic bike frame in the world, until the next Olympics that is. 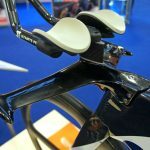 With aerodynamics being one of the most important factors in performance cycling and the general public having no more insight into the drag coefficients than the sales brochures; it’s fascinating to see the pinnacle of the current development if only as a visual reference point. I wanted to share this as I find not just the engineering, but also the process interesting. So finding the perfect aerodynamic shape is only half the battle, if you haven’t got the ability to make it into a strong, stiff and efficient machine then the advantage is lost. I’m off to the garage to custom fit some aero-bars to the shape of my hands and forearms using duct tape and modelling clay, should shave a few seconds of my personal best, marginal gains and all that.